In this tutorial, we will learn about the followings. Program To Find The Length Of A String in PHP And MYSQL With Database. To find the length of a string, we need to use the built-in function strlen($parameteres). This functional automatically find the length of a string. In this example, the programmer stores the values in variables. However, if you interested to see the program about taking values in the form, please see example 2. In this example, we will take the inputs from the user and store them in variables. We are developing two web pages. First_page is the page in which all the main functionality of the program is done. Connection.php is the page containing only database connection for first_page.php. Database and tables are shown below. Figure: Showing table for the length of string program with database. 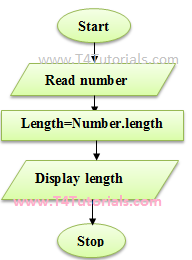 Figure: Flowchart for the program of the length of a number.